If you are looking for a monocular to use at night or complete darkness then you should consider a night vision monocular. These monoculars use a built-in IR illuminator to allow night vision capability. They normally have less magnification in order to provide a better image (less fuzzy). Night vision monoculars range in sizes, magnification and price. I am lucky to live at the beach and I’d like read the names of the ships on the horizon and what the captain is having for breakfast! From your advices above, I realize something on a tripod may be necessary (is it?) So your recommendations would be valuable to me. Thanks. Please note that “Panda” is not a reputable brand and the true magnification of the monocular is more likely just standard (8x or 10x). The image quality of a handheld monocular with anymore than 10x power will not be good. Products which advertise too much magnification are usually false. Not all monoculars have a minimum focus distance of 3-4 meters. The Leica Monovid 8×20 has a minimum focus distance of 18 meters. I can personally vouch for the great quality of the Monovid. It would be a GREAT classroom monocular. Hi, looking for a binocular for shooting paper targets at 25 & 50 yards what would be a your suggestion? We believe that the compact binoculars (Bushnell 8×25 H2O) would work better than the other two monoculars. Especially if you will be spotting the subjects from a moving vehicle (or if their vehicles will be moving). We would definitely not go with the Vortex Solo 8×25 monocular as it is very difficult to locate your subjects with. The view is too narrow. The Vortex Solo 8×36 monocular is an excellent product with a wider view and sharp image – it will work but again, not as effective in your case as the Bushnell 8×25 compact binoculars. We hope this helps. In any case you are very welcome to order, test and return as long as the product remains in a brand new, re-sellable condition with all included accessories and product box unused and in mint condition. I’m a police officer in Victoria. While patrolling in the sedan, we like to scan surrounding vehicles for suspect behaviour and individuals. Currently, we need to drive very close to other vehicles in order to see. I was wondering would the Avalon 10×42 be the best option to aid me with this task? The department will not subsidise this purchase so a Zeiss would be out of the equation. I’m in the investigative field and often use binoculars for surveillance. I prefer to use a monocular/power scope , one reason due to it’s compactness. Though, there are many brand names and when searching for a 10×30 or higher, there’s more to it than simply picking any brand with those specs. I want durability and clarity to start, but overall something that will last. What are your recommendations for my needs? I don’t have reliable bifocal vision. Sometimes I wish my lazy eye would just turn off but it has the annoying habit of turning on when I look into binoculars. I have tried using them with the cap on that side of the binoculars but then the peripheral vision will come into play and I end up with double vision.My good eye trying to use the binocular and my stupid eye looking to the side. I get tired keeping it closed and have tried and eye patch. I end up looking silly and my eye looking at the inside of the eye patch. I am a bird watcher and have an excellent scope but I want something smaller. So could you recommend 1) the best lightest widest field of vision – no budget limits and 2) the compromise one – best value for money. Thank you. All three monoculars are waterproofed, fog-proof and durable. We hope this helps. What the first two numbers with a minus sign refer to? For example, 20-60×80. I know what 80 means, but I am confused about 20-60x. Anyone can help? Binoculars usually have a fixed magnification, for example 10x or 20x. Spotting scopes (monoculars) normally have variable magnification. So 20-60x for example means 20x to 60x magnification. This means you can adjust the magnifiction when viewing. Just like you would do with a photographic camera or video camera. Can you suggest a suitable monocular for carrying around in my handbag? I have trouble seeing the numbers on approaching buses even though I have spectacles. The Avalon 10×42 will work perfectly in your case. It is small enough to fit in a handbag and very lightweight. We are looking for binoculars for several purposes. We are going on safari which we will probably do more than once, we also live near the bush and would like something that allows us to see birds well so this is something we would use them for more often. Naturally having something that we can use for general travel also has value. We have not yet looked extensively but did find the Nikon Monarch 5 8×42 to be comfortable and clear but we were in a shopping centre so it is not really a good test. In particular the way in which the eye pieces extended away from the glass helped with an uninterrupted view. As my husband has only one eye we were curious whether a monocular would be better for him than binoculars in terms of vision quality. Does an 8 or 10 x monocular have more image shake than its binocular equivalent ? Your advice wild be appreciated. The Nikon Monarch 5 (8×42 or 10×42) are one of the best binoculars you can own for birdwatching, Safari or general use. No doubt about it. In terms of their optics, beautiful lightweight design, wide field of view and most of all image quality they are right up there with our $800-$1,000 high-end models! Therefore they have been one of the most popular choices by our more avid customers over the last 3 years. Now, regarding a monocular, if you will be using the optics often, especially for birdwatching, we wouldn’t recommend a monocular. The view is quite limiting and the design is not very comfortable to hold and stabilise for extended periods of time. It is still a great tool to carry in your bag or car and to have a “quick look” at something. But if you are viewing birds or wildlife we will always recommend binoculars. Your husband, even having only 1 eye, will find it easier to hold and use good binoculars than a monocular (again, for frequent or prolong use). The image is also significantly better since 8×42 binoculars such as the Nikon have a much wider view than a monocular – even using only the 1 eye. I have tested this theory while closing one of my eyes and using both the Nikon Monarch binoculars and the Avalon monocular. The binoculars definitely came on top! I am looking at buying something for pest contro;l needs. I have a termite nest up a tree about 20 meters high and need to look closely at it to see if any termites come out of shell when broken, What instruments will do this for me. 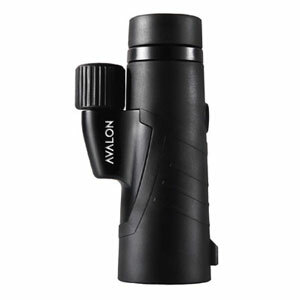 I was looking at a Avalon monocular 10×42 which looks suitable.. Something small and rugged would be good as I can then take it into subfloors also. Yes, a monocular would definitely work in this case. You do not need to much magnification for looking up a tree and since you are looking at a very small area (termite nest) you would benefit from a monocular’s narrower field of view. The Avalon 10×42 is a good choice as it is compact, very rugged and has a-lot of light intake due to its larger 42mm lens.